Recollecting the events of 2014, let us look back on the Loch Ness Monster and those who claimed to have seen or represented Scotland's most famous inhabitant. As the Referendum on whether Scotland should be an independent nation approached, it was less than seriously suggested that there would be no Nessie to spot as various cartoons were published showing Nessie heading south for more stable waters. Not that I would blame her for making that decision, but as it turned out, there was no need to panic as Scotland remained in the Union. Below is one example of the Loch Ness Monster cartoons that amused us during some tiresome and heated campaigning. Shades of Godzilla! 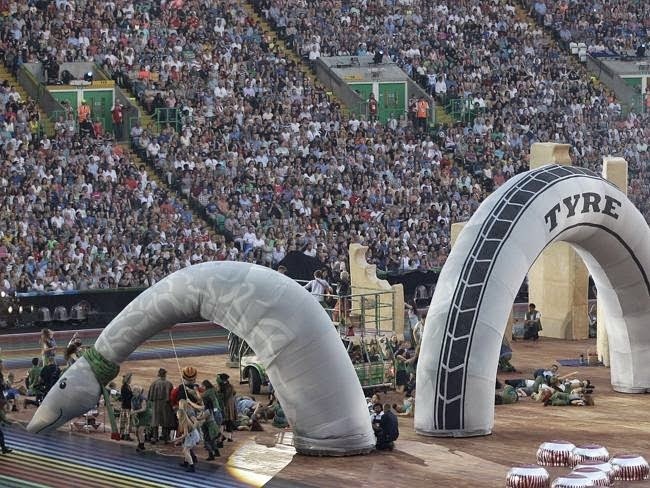 Nessie, as a major Scottish icon, also made an appearance at the successful Commonwealth Games in Glasgow during the August Opening Ceremony. You can't keep a good monster down! However, I think the hybrid tyre form is a reminder that not all things we see are necessarily the Loch Ness Monster. But what of the creature itself? Back in April, the newspapers got a bit heated about an object that had appeared on Apple's satellite images of Loch Ness. I actually covered this image at the tail end of 2013, but it took a few months for it to be picked up by the wider media. The consensus definitely moved towards this being one of the Jacobite cruise ships, albeit it looked a bit odder than previous images. Following hot on the heels of this satellite image was a sonar image that raised eyebrows only days later. It was recorded in Urquhart Bay by one of the aforementioned Jacobite cruise ships. The object was about 30 feet below and registered a signal stronger than that the similar crescent shape we would see for the swim bladders of fish. Was it the monster, a seal, a sonar recording anomaly or something else? No seal was reported in Loch Ness and one is left in an inconclusive state as to what was registered that day. Consulting Gary Campbell's web log of sightings, two other stories come to the fore. The first was an object seen on Google Earth by Bjarne Sjöstrand, once again in April. You can see the vertical filament object at coordinates 57°10'25.30"N, 4°36'53.53"W just off the Horseshoe Scree. It is just above the centre point on the image below. Now, we have seen similar objects on Google Earth before back in 2011 and were non-committal on them, mainly because they were un-Nessie like in their shapes. This one looks no different. However, we did have two more traditional sightings from people who spotted strange objects from their vantage points on the loch shore. Referring to Gary Campbell again, nine people watched an object and its wake from Brackla on the 20th May about 10am. They watched it for 15 minutes before it submerged. Photographs were taken, but at over a kilometre away, these are inconclusive. .. an amazing sight. I travel this road to Whitebridge daily and have never seen anything like it. However, neither of these accounts made it into the newspapers. The bottom line these days appears to be, "No Picture, No Story", and by that we mean a semi-decent image. Thankfully, we have people that still collect these verbal accounts for the record. This year was also the year that Jonathan Bright's hump photograph went viral at the time of the Scottish Paranormal Festival in October. And, no, I don't think it is a wave. But, in keeping with the Loch Ness Monster, we did have our false alarms. In November, a local by the name of Richard Collis filmed an object looking like a long neck sticking out of the water. Not committing to anything until the witness was spoken to, our own man on the spot, Jonathan Bright, was on the case within hours, and revealed it was no more than a lifeless object, perhaps a branch or something else. In fact, I was told recently that the object is still there and is probably not a branch but a human artifact, such as a boat part. The main thing is, it lingered, and real Nessies tend not to hang around! We also had a blast from the past in October as archive research by David Clarke revealed that there was a monster battle in 1934 when Nessie fever was high. An academic tussle arose between the Natural History Museum in England and the Royal Scottish Museum for the rights to the carcass of the Loch Ness Monster. Was Nessie a British monster or a Scottish monster? An appropriate topic in this year when Scotland decided its national fate. Back in 1934, they never had the opportunity to put it to the test. Let's see what 2015 brings!